Lionel Messi’s introduction completely changed the game as Barcelona preserved their unbeaten record in La Liga on Saturday with a 2-2 draw away at Sevilla. The Blaugrana looked like they were heading towards their first defeat of the season in La Liga but two late goals in 54 seconds from Luis Suarez and Messi meant they claimed a share of the spoils. On as a substitute just before the hour mark, Messi was the hero yet again. Remarkably, he didn’t even break a sweat in the time between Barca’s goals. He didn’t run around much during his time on the pitch, nor did he need to. As per Guillem Balague following kick-off after Suarez had made it 2-1, the 30-year old only broke into stride when he tucked away an excellent equaliser. ⏱ 50′ – Luis Muriel celebrates in front of Lionel Messi after putting Sevilla 2-0 up vs. Barcelona. “[He was told] to not risk anything he was asked not to do long sprints and not to change pace very quickly,” Balague wrote in his piece for Sky Sports. “He did that, and in the 54 seconds between the two goals, if you watch him, he walks. He’s just on a whole new level, isn’t he? And it harks back to his virtuoso performance in the 3-0 El Clasico win over Real Madrid back in December, where he set up one and scored a penalty. According to El Periodico, the five time Ballon d’Or winner spent a huge amount of that match literally strolling about – 83.10% to be exact. 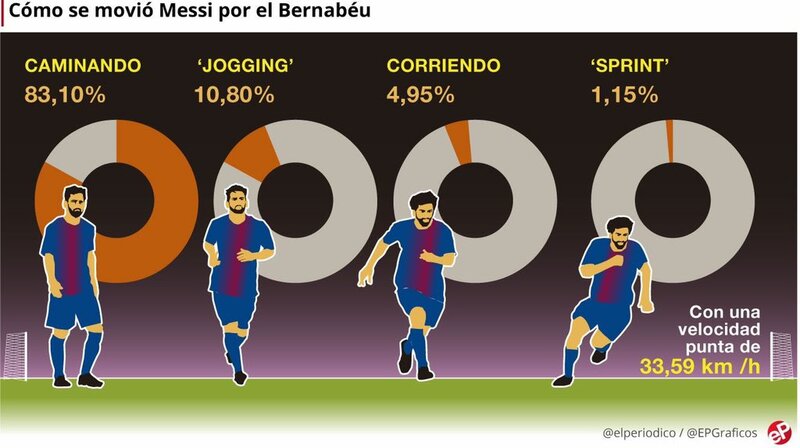 Incredibly, the stats say that Messi ran for less than four and a half minutes of the match whilst his sprinting time was even less, at about one minute of the 90.